There are several types of marriages and partnerships. In automotive world it’s common to hear about merges, acquisitions and divorces among car makers that look to survive. There are strong ties such as Peugeot and Citroen, VW and Audi, Fiat and Alfa Romeo/Lancia, Chevrolet and Cadillac, Hyundai and Kia, and so on. There are other with more difficulties, like GM and Opel, or VW and Seat/Suzuki. But perhaps there’s only one with the most weird situation: Fiat and Ferrari. Few people know that the fantastic super car manufacturer makes part of Fiat, and there are many reasons that explain this. First of all, Fiat’s automotive division is divided into two mainly parts: Fiat Group Automobiles, which includes Fiat brand, Fiat Professional, Lancia, Alfa Romeo, Abarth, Jeep, and Mopar. And Luxury and Performance brands that include Ferrari and Maserati. This is the way the group works now, but it will change as soon as Fiat buys the remaining part of Chrysler (latest news indicate that Fiat may switch from the Milan exchange to NY one’s once the purchase operation is completed). 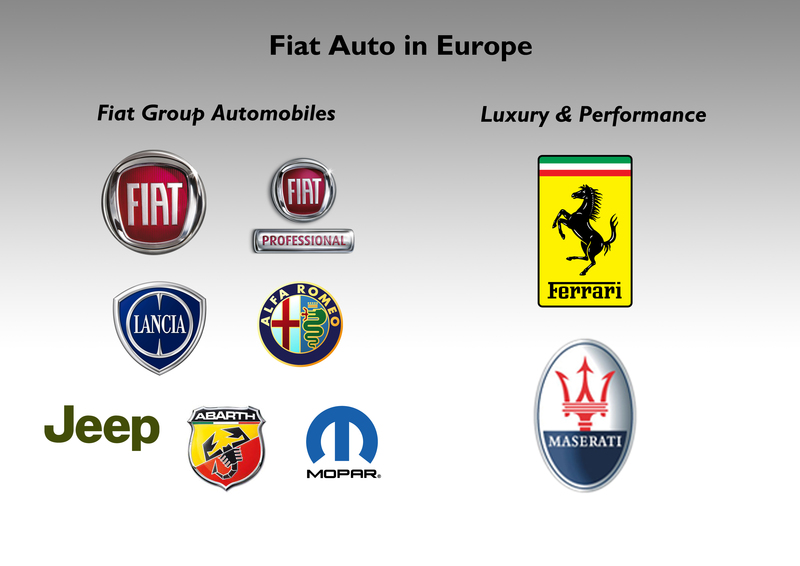 The division between Fiat and Ferrari includes different legal societies, events, management, marketing, and finance (their results make part of the same report but their operations and details are separated). That’s how Fiat headquarters in Turin are not involved in Ferrari’s day-to-day activities. There are a lot of reasons for this split (economic and politic), but, in my opinion, it doesn’t seem to be the best thing. Ferrari is maybe the world’s best-known car brand with the highest number of fans (more than 11 million in Facebook). It is the referent of sporty and high performance cars, and is one of the brands to lead in technology field. This amazing car brand is also an example of how to do the best marketing. Unfortunately these good aspects of Ferrari don’t make part of the other brands of the group. It seems like Ferrari lives in its own territory away from the troubled FGA. The situation between Ferrari and Fiat is like the son that became rich and doesn’t want to know anything from its poor and complicated family. It’s quite understandable Ferrari’s position as it wants to protect its image staying distant from the mess in FGA (problems with sales registrations, bad quality of some of its cars, management problems). Part of the success of Ferrari is not only the cars they produce, but the brilliant way the sell and promote them. Part of the problem of Fiat is the bad image it has among many buyers. But I think this weird relationship must change. It makes no sense to have one brand suffering because of image, and another one making use of it. Ferrari gained its good reputation thanks to hard work and excellent cars. Then it should help its troubled brothers so they can make use of its experience and improve their position in the market. Yes, it is not possible to place Fiat brand/Lancia/Fiat Professional and Ferrari in the same place. They are completely different brands with different targets. But Ferrari’s know how could be an extremely valuable asset for them. There should be more cooperation between them and just as it happens with Ferrari and Maserati (they share some engines and technologies), the same should happen with Alfa Romeo and Abarth. Besides this collaboration, which may not be the best thing for Ferrari, Fiat Group should work more on associating Ferrari’s name with the other brands. I mean, people should realize that the group that makes the awesome Ferraris is the same one that builds the popular Fiat 500. It means that the group should focus on more communication efforts to outline that they are all Italians and they can do the best high performance cars, but also the best city cars. Is like VW and its brands. Most people know that Audi, Porsche, Seat and Skoda share components, technologies and platforms but it doesn’t mean that the image of each one of them is negatively affected. ← Maserati Ghibli or BMW 5-Series? Si. I ragazzi che gestiscono il sito sono un pò incasinati in questi giorni. Loro devono dare gli esami e quindi hanno smesso di scrivere. Lo rifarano tra alcuni settimane. Look at the F1 car. You’ll see the FIAT right in front of it. Fiat should use more this image, its emblematic! Imagine an Alfa Romeo (top) with a Ferrari or Maserati engine? I think it would be perfect. I like your view Dario, but, Fiat should start to use more properly all the group components, like VW group does. The engine that equip Audi and VW are basically the same (this doesn’t apply to my region by the way). Fiat could start share Alfa Romeo and Maserati components with Ferrari etc. This is a good idea to improve it. You want a good example of it? Go below and check Lancia Thema 8.32. It uses a Ferrari engine. Imagine you buying an Alfa Romeo using a Ferrari Engine? I think its a good option to improve Fiat’s products using Ferrari image. but you can use ferrari components only on a certain kind of cars..
Complimenti Juan, ho scoperto il tuo sito da poco, i tuoi articoli sono davvero molto interessanti e ben fatti, è un piacere leggerli!! Ti ringrazio Leonardo. È un piacere condividere la mia passione con lettori come te. Continua a seguirmi perchè c’è sempre molto da analizare. Ciao! Uno dei pochi siti che hanno monopolizzato la mia attenzione! fiatgroupworld.com you made my day..every day!Thanks Felipe! Isn’t about it. Collaboration doesn’t imply making the same cars or rebadging products. There can cooperation from the point of view of engines, communication, sponsorships, marketing campaigns, design. First comment here despite having been reading this blog for a while. Great blog by the way, Juan. 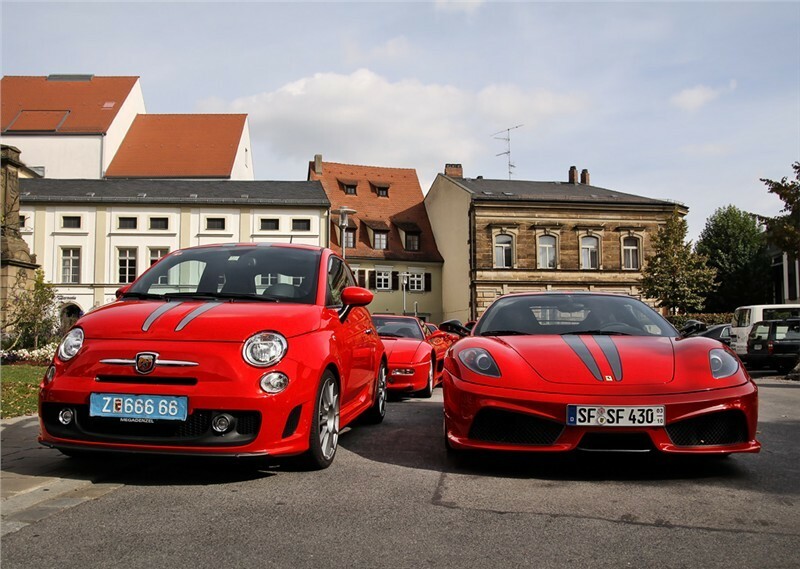 I guess Fiat is already planning on some further intergation between the Group and Ferrari. According to La Reppubblica: “In 2014 then, finally, we will again see a big Alfa Romeo going on sale. This 166-successor will be built in Mirafiori together with the Maserati Ghibli and will (or at least should) be a major threat to the established German brands in the E-segment. With both rear- as well as four-wheel drive, an 8-gear automatic, a V6 petrol (producing over 400 bhp) from Maranello”. I assume that if the engine is coming from Maranello it is probably from Ferrari, right? Thank you very much ‘fgainsider’. For the big Alfa we will have to wait but the 4C is a good example of what this brand can do when it wants to. As you say, the engines for this E-Sedan are suposed to come from Ferrari as it happens with Maserati. The cooperation between Ferrari and Fiat Group must evolve in the coming years.